Reduce your Hydraulic oil wastage & component Failure by FILTEK Technology. Water is the primary contaminant found in hydraulic systems. If water is not removed promptly it will emulsify or thicken the oil, drastically reducing its lubricating qualities and increasing the equipment's internal wear rate. Often, as a practical solution, maintenance managers will increase the size of the oil sump and change the oil and filters earlier and more often to reduce equipment wear. This, of course, increases the cost of doing business. What if you could keep your oil clean, instead of changing it? Technology from Filtek can keep hydraulic oil constantly clean while the system is operating, dramatically extending oil change intervals by hundreds of hours. Simply put, if the oil is clean and the water is removed, it does not need to be changed. 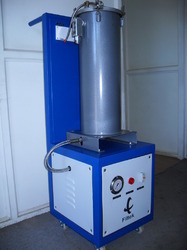 We are providing Portable Hydraulic Oil Filtration System. It reduces Hydraulic oil wastage & component Failure by FILTEK Technology. Technology from Filtek can keep hydraulic oil constantly clean. Simply put, if the oil is clean and the water is removed, it does not need to be changed. Looking for Portable Hydraulic Oil Filtration System ?